Need to Weed Your Roof? In an effort to conserve energy, reduce storm water runoff and deflect heat, the roof of Chicago City Hall has been transformed into a brilliant garden. The best thing you can say about the roofs of most city buildings is that you don't have to look at them much. That's very good, since an urban landscape viewed from above can be an unlovely thing--block after block of tarred black rooftops, sticky in the summer, windswept in the winter, ugly year-round. Or at least that's the way it used to be. 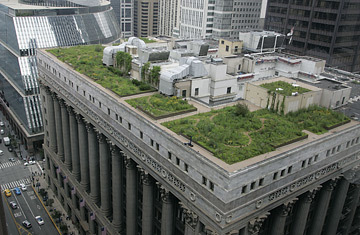 But urban roofs are going green. Environmental designers looking for new ways to soften cities have begun to realize that the tops of buildings don't have to be wastelands. Indeed, they can be gardens, planted with grasses, flowers and shrubs that control temperature, conserve water and clean the air. A newly published paper in the journal BioScience reveals just how much good green roofs can do. A planted roof usually comes in one of two varieties: extensive or intensive. The extensive type is wide and shallow, with a soil depth of less than 8 in. (20 cm), able to support smaller plants. The intensive type may be smaller, but it's deeper and home to larger plants. Whatever the design, green roofs are a lot more complicated than ordinary gardens. They have multiple layers beneath the soil, including a filter membrane, a drainage layer, waterproofing, insulation and structural support. But this elaborate infrastructure can do a great deal of good. The BioScience paper, which aggregated years' worth of other studies, reported that green roofs can cut heat loss from a building 50%, reduce air-conditioning costs 25% and reduce the so-called urban-heat-island effect--the tendency of cities to retain heat--by 3.6ºF (2ºC). Green roofs are by no means limited to the city, but it's in cities that they're needed the most. Chicago already has more than 2.3 million sq. ft. (214,000 sq m) of rooftops planted, and more are on the way. Other rapidly greening U.S. cities include Washington; New York City; Phoenix; Kansas City, Mo. ; and Portland, Ore.
Of course, for all the square feet greened and heat reduced, there is one less quantifiable metric that argues even more persuasively for the value of the green roof: the psychological boost that city dwellers can gain simply by having a quiet place to go, far above the churn of the streets. As so often happens, what's good for the planet can also be good for the spirit.